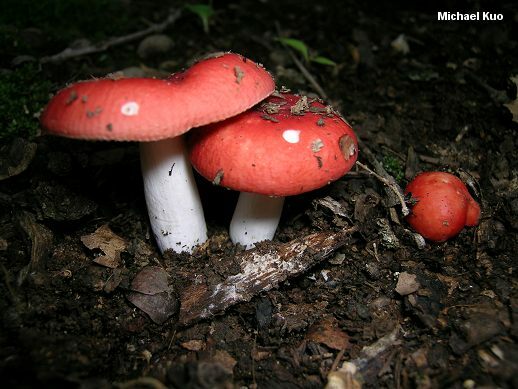 Russula cystidiosa is an oak-loving red russula from eastern North America, featuring a bright red cap, a white stem, mild taste, and a creamy to yellowish spore print. 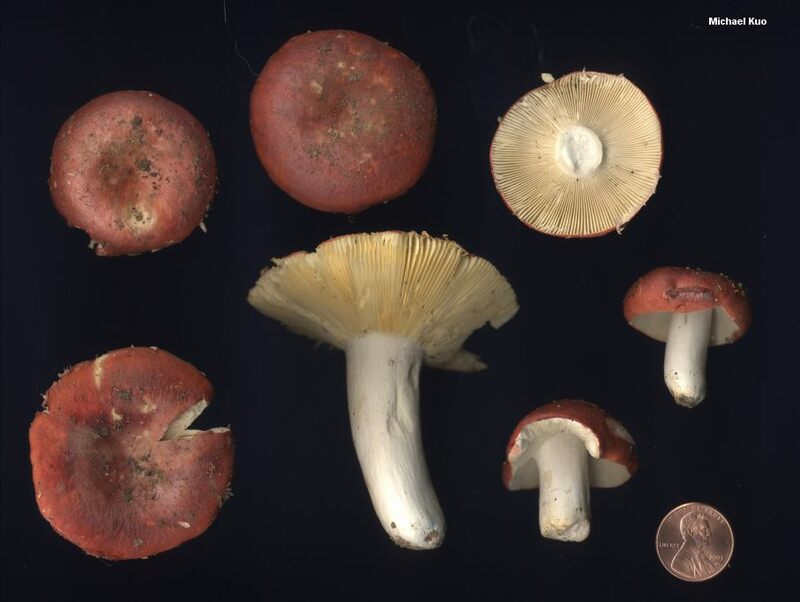 Since several other species share these features, microscopic analysis is probably necessary for certain identification: Russula cystidiosa features abundant, clavate pileocystidia and spores with well developed warts. Ecology: Mycorrhizal with oaks and perhaps with other hardwoods; growing alone, scattered, or gregariously; summer and fall; widely distributed in eastern North America from Florida to Illinois and New Jersey. 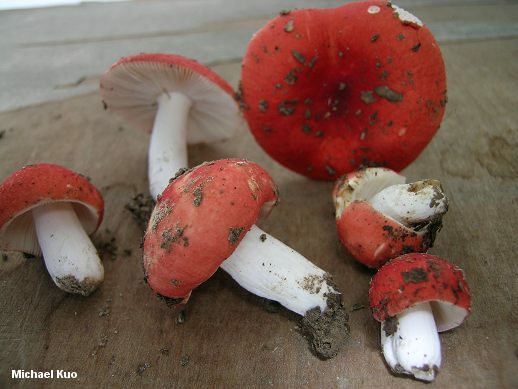 Cap: 3.5-11 cm; convex when young, becoming broadly convex to flat, sometimes with a shallow depression; dry, or sticky when wet; very finely velvety; bright red to deep pinkish red; the margin usually slightly lined at maturity; the skin peeling fairly easily, often halfway to the center or more. Gills: Attached to the stem or running slightly down it; close or nearly distant; white when young but creamy or pale yellowish with maturity. Stem: 2-7 cm long; 1-2 cm thick; white, or sometimes flushed with pink; dry; fairly smooth. Chemical Reactions: KOH on cap surface orange; iron salts on stem surface negative to pinkish. 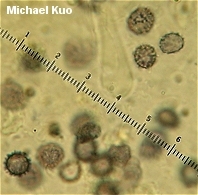 Microscopic Features: Spores 7-12 x 6-10 µ; with high warts extending 1-2 µ high; connectors scattered, or sometimes creating reticulated areas. Pleurocystidia abundant; subclavate to fusiform or mucronate; projecting. 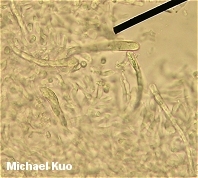 Pileipellis a hyaline cutis with filamentous hyphal ends with acute apices; pileocystidia abundant, clavate to cylindric, to about 100 x 10 µ, ochraceous-refractive in KOH and weakly positive in sulphovanillin. REFERENCES: Murrill, 1940. (Murrill, 1940; Kibby & Fatto, 1990; Fatto, 1998; Binion et al., 2008.) Herb. Kuo 08270503, 07050701, 06070804.